This screen is accessed from the back-end Joomla! administrator panel. It is used to preview and templates in your Joomla! website. Select the 'Templates' menu link from the Template Manager: Styles screen. 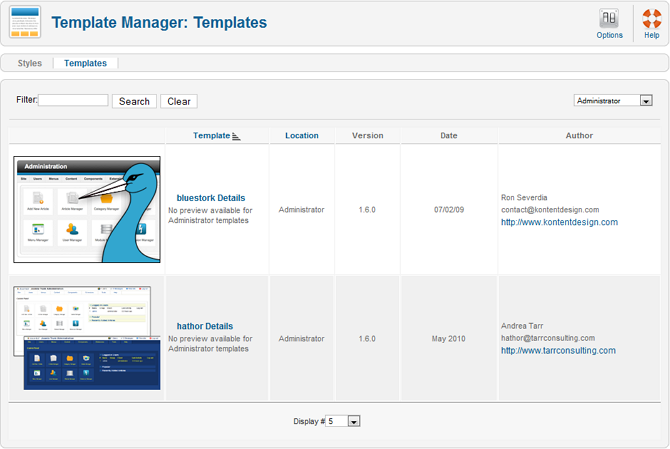 The Template Manager: Templates screen allows you to preview and edit templates which are installed in your Joomla! installation. Click on the column heading to sort the list by that column's value. Template. The name of the template. Location. Whether the style is a public front-end or an administrator back-end style. 'Site' means it is a public front-end style. 'Administrator' means it is an administrator back-end style. Version. The version number of the item. Date. The date the item was created by the developer. Author. The developer of the template. You can filter the list of items by typing in part of the Title. If you have a large number of items in the list, you can use this filter to find the desired item(s) quickly. Enter either part of the title or an ID number and press 'Search' to display the matching items. You can type in whole words or part of a word. For example, "ooml" will match all titles with the word "Joomla!" in them. Click 'Clear' to reset filtering. Only items matching the selection will be displayed in the list. Select Location. The location the template is used in - Site or Administrator. Display #. The number of items to display on one page. If there are more items than this number, you can use the page navigation buttons (Start, Prev, Next, End, and page numbers) to navigate between pages. Note that if you have a large number of items, it may be helpful to use the Filter options, located above the column headings, to limit which items display (where applicable). Options. Opens the Options window where settings such as default parameters can be edited. See Options. Help. Opens this Help Screen. Styles. Click this link to go to the Template Manager: Styles screen. Templates. This link takes you to the screen you are currently on. This page was last modified on 28 April 2013, at 18:43. Content is available under Joomla! EDL unless otherwise noted. Joomla!® is a registered trademark of Open Source Matters, Inc. If you are experiencing technical issues with this website, please report it . Notice a content problem? Create an account and fix it.